In this "5-minute masterclass" we’re going to take a look into the diminished chord and scale. Diminished scales and chords are a very important subject. Diminished harmony works as a ‘base’ or a ‘spine’ to all harmonic movement. it works as a dominant function and each diminished chord is a rootless dominant b9 chord for 4 different dominants. it works as a pivot chord; meaning for example in a case of a modulation, it can function as a chord that is connecting different keys. In this chapter of the lesson, we will explore how to view the diminished scale. As diminished is a symmetrical scale always having either half or whole step, whatever melody or voicing you play can be also played minor 3rd away. 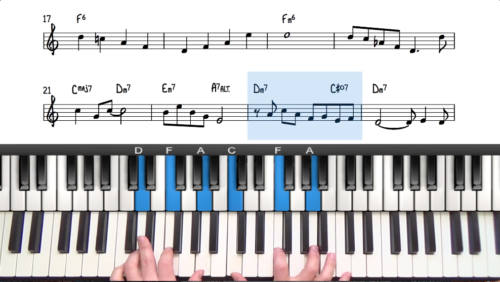 This allows you to play the same melody, up or down the piano in 4 different places. With this way of thinking, we actually have only 3 different diminished chords and scales, as they repeat in every minor 3rd. When it comes to the 25 and 251 progression, you can think of it as one scale to play over both the 2 and the 5. For example Dm7-G7, you should just think of D Diminished. One of the most fascinating things about diminished is the symmetry. You can find good strong melodies and just move them in minor 3rds as per the examples in this lesson. let’s start with a simple major triad derived from the scale. next, we can add an additional note to the triad. Let’s take a major triad and add major 6th. one more, having an inversion of a major triad and adding minor 3rd in the chord gives you a cool sound. Using this theory, you can find patterns and voicings easily yourself, explore the diminished by having a simple melody or a chord and moving it in minor 3rds. Take these patterns through all 12 keys and think about the different chord tones and landing points to resolve your patterns and lines. Welcome to part 2 of this lesson on the tune Stardust. In part 1 we explored the 16 bar introduction and now we’re going to move into the main tune. “Stardust” by Hoagy Carmichael is 48 bars long including the 16 bar introduction. From bar 17 onwards, the tune then follows a standard ABAC form. Diminished scales are symmetrical and repeat in minor 3rds meaning that 1 diminished scale is actually 4 diminished scales. There are only 12 keys which means that there are only 3 diminished scales. Each of these scales can be used for material over the 4 dominant 7th chords, and the 4 diminished chords in which it is related. Each diminished scale contains 4 major triads which can be used to create melodies, patterns, and improvised material. Add the major 6th to these triads for additional melodic possibilities. Add both the major and minor 3rd in these triads for even more melodic possibilities. 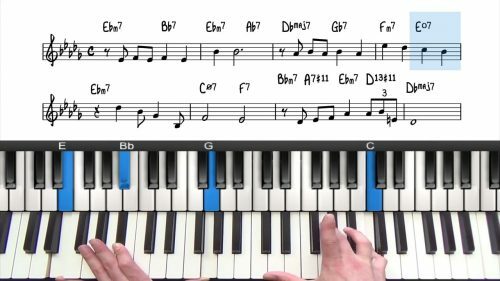 Learning these patterns will help you find great sounding diminished material for your improvisations. Any melody can be transposed up or down in minor 3rds to achieve a diminished sound and quality.